After two obscure T.V. movies, Joel Schumacher decided to helm this torrid misfire as his first feature film. The Incredible Shrinking Woman is a collision of dark, dramatic science fiction undercut with felonious comedic overtones (the font of the opening titles might have been used later on in the flick Wargames). You watch in disbelief as scenes that are suppose to be funny, actually make you queasy. To this day, Schumacher continues to be a director and I'm okay with that. After The Incredible Shrinking Woman, you'll notice that he stayed away from making comedies (unless you count Batman and Robin as comedic, just kidding). Entertaining in spots and sometimes loaded with fanatical wit, this moderately successful release from 1981 was something I viewed as a kid (religiously on cable of course). Fast forward 25 years later, and I realize that I am a much different person now then I was back then (of course right?). 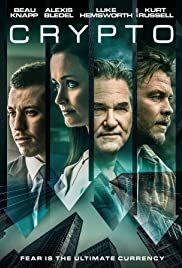 This is one of those flicks in which you take a closer look at what's on screen and find yourself feeling criminal, like you need to be arrested for viewing something so misguided and ultimately, so out of whack. Everyone in the cast seems to be obsessed with wearing bright colors (from what I saw, I'd say pinks, oranges, light reds and yellows), the movie sledgehammers the art of consumerism (could there be a connection, maybe), and its main character/subsequent hero (Lily Tomlin as Pat Kramer) is so frowned upon, so belittled that you don't root for her, you just feel sorry for her. Once more, I couldn't figure out why so many great actors/actresses decided to sign on for this thing. One of them was in Rosemary's Baby, one was in Deliverance, and three of them were in Nashville (all movies with a slew of Oscar nominations). I guess even famous, rich movie stars sometimes fall behind in their mansion payments. Projecting itself as either a fantasy or possibly a movie that takes place in a dreamlike state (the bright hazy look from cinematographer Bruce Logan might suggests this), The Incredible Shrinking Woman is about suburban housewife Pat Kramer (Tomlin) who's life seems pretty happy. She has a lot of friends, a great husband (Charles Grodin likable as ever), and two cute children (keep in mind these misfits don't really have any lines in the movie, they improvise by giving new meaning to the phrase, "kids say and do the darndest things."). About ten or so minutes into the film, Vance Kramer (Grodin, who's character has a job in advertising) by accident, spills some experimental perfume on his wife and within minutes, she begins the shrinking process. Within a day or so, she goes from 5'7" to 5'5", within a week she's looking over the steering wheel to drive, and within a month, well you get the point. Over time, word gets out and Kramer becomes famous, so famous in fact that a couple of mad scientists (Henry Gibson and Elizabeth Wilson) want to kidnap her, get blood from her, and use it to shrink the rest world (I don't get why anyone would want to do that, honestly what would anyone gain from it). With special effects that clearly needed to be redone (when Tomlin shrinks down to nothing, everything that appears around her looks bigger and ultimately looks fake, especially food that mistakenly gets dumped on her) and villains that act like they're disconnected from the rest of the cast, there are flaws that run rampant in this exercise. But as I noted in the first paragraph, the movie's ultimate demise for me, has to do with the screenwriter getting the viewer completely involved with the dark storyline and then shifting gears to lighten things up. This is done by the use of forced laughter. It simply doesn't work because we're talking about a woman dwindling down to nothing, being forced to live in a doll house, accidentally falling down a garbage disposal (almost dying I might add), and being locked in a hamster cage for scientific experiments (what's really strange is that the secretive, scientific lab where she is hidden/kidnapped is right next door to her neighborhood shopping center, what the...?). This is not supposed to be funny and if it is, I must have missed the boat entirely. It certainly doesn't help that Tomlin is also doing the narration throughout the proceedings. Her tone and the background music that accompanies it, just seems eerie and not fit for what was advertised as a so called comedy. On the other end of the spectrum, and in an almost unnecessary way, there are a couple of scenes in this exercise where melodic human behavior is taken to the extreme (I feel only Chevy Chase does this effectively). It's as if the filmmakers wanted to wring the neck of the moviegoer by taking an uncomfortable situation as far as it will go. I figured it was supposed to be funny but I wasn't completely sure. The camera kept rolling and I begged Mr. Schumacher to yell cut! You'll see what I mean when you witness a confrontation in Tomlin's car with her incredibly annoying children, a mishap with a potent form of crazy glue (it's called "galaxy glue" in the film), and a cringe worthy encounter between Tomlin's ever shrinking character and robotic toys (what nonsense). But let's be fair, the performances aren't all that bad, the storytelling is adequate, and monster special effects guy Rick Baker, is entertaining as Sidney the ape. There is also an appearance by Kramer on The Mike Douglas Show in which she is less than a foot tall. The Kramer character is now famous and although a little silly, this sequence as a whole feels stronger and more genuine than everything else in the barely 90 minutes of running time. Still, I can't give this film a positive review because I would have no argument to suggest anything otherwise. I'm not sure if it was intentional, but Lily Tomlin literally gets put through the wringer in more ways than one. She plays four characters in The Incredible Shrinking Woman (the other three are fairly irrelevant) and the one that matters is made to look inferior. It's a shame because I can't get it out of my head that this film could have been decent. For starters, it seems like a solid pitch for a Hollywood executive to listen to. I'm not kidding. The only problem is this; I think this script might have looked good only on paper. Nevertheless, it's safe to say that things totally went south when the cameras started rolling. 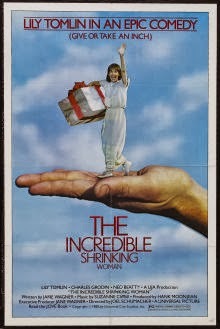 The Incredible Shrinking Woman, I'm sad to admit, is "the incredibly sinking ship" when it comes to cinematic equivalency.